Recently I needed to list all process chains that will be executed in next 24 hours in SAP BW system. I looked to SAP basis tables like TBTCO (Job Status Overview Table) and TBTCP (Background Job Step Overview). But I didn’t succeed. Even custom ABAP report (like advised here) didn’t help me. Then I found out that actually this requirement is covered by standard BW tcode. It is t-code RSM37. The tcode gives a jobs and corresponding process chains list with its program variants. 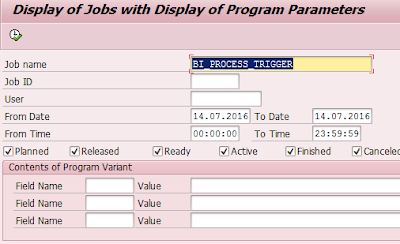 On selection screen as Job Name we can enter BI_PROCESS_TRIGGER because it is most common job name for the PC. The name like this comes as default and usually it is not common to change this name. Then by specifying all statuses of the job (like planned, released, ready, active, finished and cancelled) and by giving time interval we get a list which we are interested in. In the output screen just filter on column Selection for value equals to CHAIN and list of the PC is here. In mind it is very easy to use and useful t-code.